| An incredibly romantic movie! Yeah, yeah... It's the little mermaid, the same cute barbie-like character little girls love so much... But the movie is great. If you just free yourself from the sissy pink image of the movie you're in for a treat. The songs are great, by the same team who gave us Little Shop Of Horrors: Alan Menken and Howard Ashman who teamed up in Beauty and the Beast and Aladdin as well. Aladdin was their last project together with Ashman's untimely death from AIDS in 1991. The story is funny and romantic, so who cares if it's not following the original tale? A perfect movie for everyone, not just little girls. An attempt to use Disney's famed multi-plane camera for the first time in years for quality "depth" shots failed because the machine, always a monster to use because of its sheer size, was in dilapidated condition. The multi-plane shots were farmed out to another studio. Grimsby: Oh, yes urp delightful. 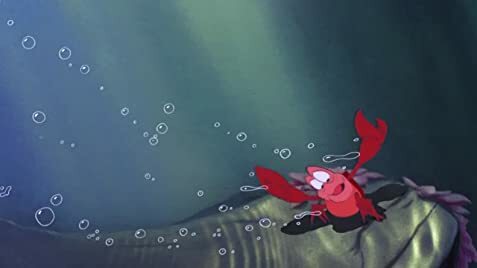 During the dressing room scene with Ariel and her sisters, the sea flower she picks for her father does not appear until just after she looks at herself in the mirror. In the original 1989 theatrical release, the original home video release, the 1998 home video release, and the 1999 DVD release, there is a scene where Ursula (as Vanessa) is marrying Eric (most of this scene is still in newer versions). In one shot you can see the Priest's knee move up and down, which looks convincingly (to some) like an erection. In the 2006 Platinum Edition release, it was censored due to controversey. It has been added back in the 2013 Diamond Edition release.